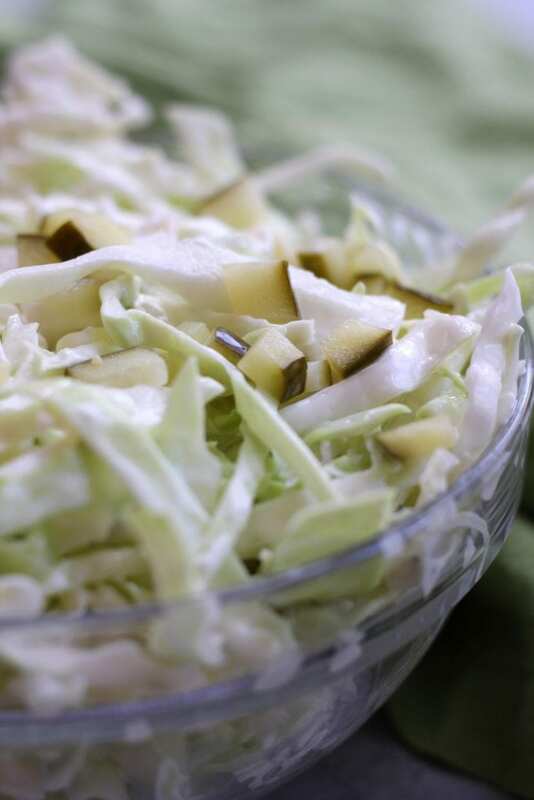 Simple Coleslaw is an easy and delicious side dish that comes together in minutes. 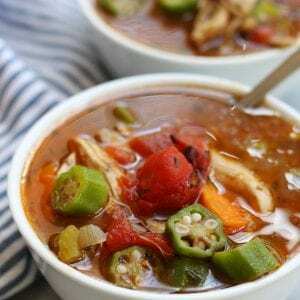 Low-carb and gluten free, it’s the perfect companion to many a dish. Life can be crazy, busy, hectic and flat out overwhelming sometimes. 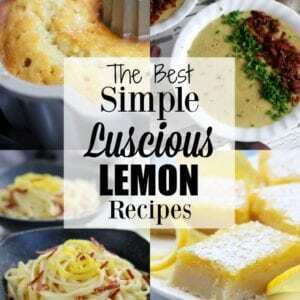 With all life’s hubbub we need quick and easy recipes that can be pulled out of our back pocket. 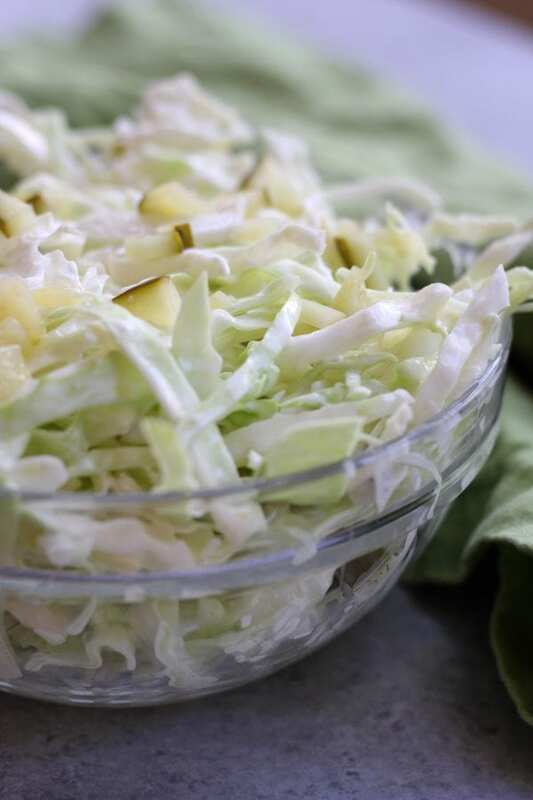 This Simple Coleslaw absolutely meets these requirements. The recipe comes together in just 10 mins, is creamy, satisfying and goes well with many main entrees. We use this recipe often with our Tortilla and Beans but it goes great with baked chicken, wraps, sandwiches or even fish tacos. 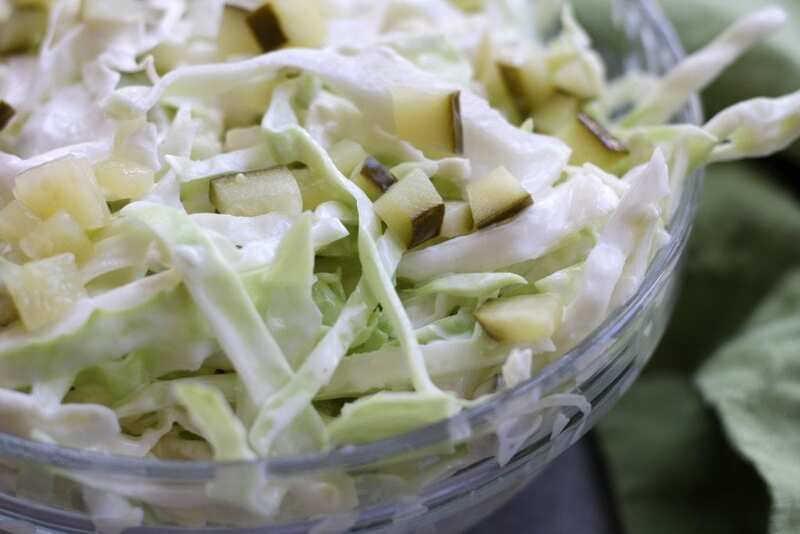 The reason this coleslaw is named Simple Coleslaw is because it has just 4 ingredients. I purposefully do not add sugar, my family never added it and honestly, we get more than enough sugar in our daily lives. If you use a food processor to shred the cabbage you will end up with much smaller pieces of cabbage. I personally enjoy the rustic look of hand shredding it. It really doesn’t take any longer and there is one less thing to clean up. Greek yogurt can be substituted for the mayo but I highly recommend finding the thickest and creamiest version possible. Pickles, don’t forget the pickles. I know it may seem crazy to have pickles in coleslaw but it is ohhhh sooooo yummy! A creamy, satisfying and easy side dish. 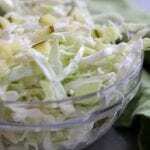 Place shredded cabbage, diced pickle, vinegar and mayo in a large mixing bowl and mix well. Refrigerate until served. Greetings from sunny Athens, Greece. Thank you Panos and Mirella! We are definitely pickle people in our house. Super excited to check out your blog. I am so glad you asked. It should be 1/4 + 2 tbsp mayo. I just double checked the recipe and I don’t see where it says 4 cups. Is the first page you are referencing from Pinterest? Yes it was, and thanks for getting back to me. I’m going to make it now, and will let you know. Thanks again!